Use the form below to inquire about Boutique Homestay At Madikeri . Use the form below to reserve for Boutique Homestay At Madikeri . Executive Rooms are in an independent unit a little away from the main house. They have a private entrance and king size beds. If you like the idea of touring a place and getting a feel of the place then this Boutique Homestay at Madikeri will keep you entertained. Set amidst lush green coffee plantations with a perennial stream flowing by, this boutique Homestay at Madikeri in Coorg, is far away from the maddening crowd thus proving to be ‘the’ most apt place for stressed-out city dwellers. The landscape is dotted with stately silver oaks entwined by pepper vines with an abundance of birds and butterflies fluttering around. The experience of staying in a serene locale with nothing and nobody but the mere sounds and sights of nature to interrupt you is equal to paradise on heaven! The stay at this Homestay leaves you refreshed and rejuvenated with beautiful memories enveloped in peace and calm. There are three types of stay facilities at this boutique Homestay at Madikeri. They are executive rooms, superior executive rooms, and special executive rooms, all of which have attached bathrooms. Extra beds cannot be accommodated in the executive rooms as they are just right for couples. The other two categories are big enough and can accommodate extra beds for them. All rooms also have private entrances so you can come and go as you please. The bungalow has been aesthetically decorated incorporating works of artisans from remote villages in a bid to support traditional artistry. Both vegetarian and non-vegetarian food is served at this Homestay. The food prepared is under the guidance of the hosts and the choices can vary from authentic Coorg food to Continental or Indian. The property was the recipient of the prestigious ‘Best Homestay in India Award 2015’ presented by Lonely Planet. Extra adults and children will be charged per night. If the cancellation is done prior to 15 days from the date of arrival: 90% refund of the total amount payable. If cancellation is done from 14 to 10 days prior to the date of arrival: 75% refund of the total amount payable. If cancellation is done from 9 to 5 days prior to the date of arrival: 50% refund of the total amount payable. The Homestay has a variety of activities like bonfire, a library, indoor board games, and hammocks to help you make the most of your stay. Within the estate, guests can enjoy nature walks through the coffee plantations; the flowing brook which adds to the serenity quotient is the USP of the place! Other than this, guests can opt to go for sightseeing to nearby places such as The Botlappa Cave Temple which is only a 3 km trek from the Homestay. If you are willing to go for full day trips the following trips are highly recommended: Dubare Elephant Camp, the Nisargadhama, and the Tibetan Golden Temple are a few options. Talakaveri, Bhagamandala and Madikeri sightseeing which covers places like Abbey Falls, Raja’s Seat and Omkareshwar Temple is also something you might want to try. The trekkers can try Tadiandemol , the highest peak in Coorg, while the Nalknad Palace and the Iguttappa Temple Kakkabe are all places of great interest to tourists who visit the area. River rafting at Irruppu Falls is an option for those who want some adventure. This Boutique Homestay is situated in Kadagadal village in Madikeri, Coorg. Coorg is at a distance of 260 km (appx 5 hrs) from Bangalore. Take the Bangalore-Ramanagara-Maddur-Mandya-Mysore-Hunsur-Periapatna- Kushalnagar-Suntikoppa-Madikeri route. Once you reach Madikeri, get to the Cariappa/Sudarshan Circle (lamp post) take the Madikeri-Sidhapur road which leads to Dubare and Orange County. Travel for 4.7 km (appx 6 mins) till you reach Kadagadal bus stand. Turn right here and take the lane leading to the Homestay. Travel for 1.5 km (appx 2 mins) on this road till you reach a fork. Take the right to enter this Boutique Homestay at Madikeri. 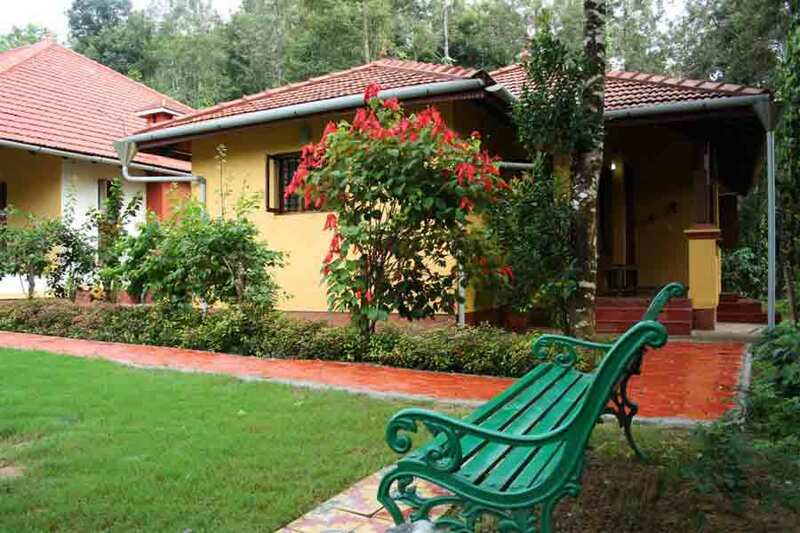 This beautiful homestay is a heritage bungalow nestled amid a lush coffee and pepper estate. Located on the Siddapur - Madikeri road in Kadagadal village, a small stretch of road, a typical estate road, leads to the property. Comfortable rooms with beautifully tiled floors synonymous with the rich cultural heritage of a bygone era welcome you. Heavy wooden carved doors with brass fittings add to the decor, giving the bungalow an opulent feel. There is a plush green lawn with plenty of flowers around. Peace and tranquillity are what greets you as you enter this wonderful property. The clean and neat bathrooms are fitted with all the amenities needed for a comfortable stay. The helpful staff and the freshly prepared homely and delicious food make this place a must-visit.